The 1959 NCAA Men's Division I Basketball Tournament involved 23 schools playing in single-elimination play to determine the national champion of men's NCAA Division I college basketball in the United States. It began on March 7, 1959, and ended with the championship game on March 21 in Louisville, Kentucky. A total of 27 games were played, including a third place game in each region and a national third place game. 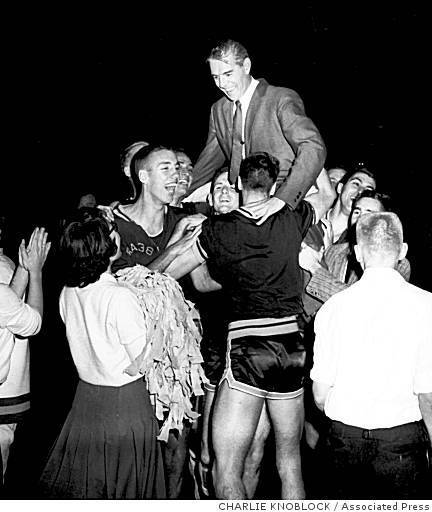 California, coached by Pete Newell, won the national title with a 71-70 victory in the final game over West Virginia, coached by Fred Schaus. Jerry West of West Virginia was named the tournament's Most Outstanding Player. West was named tournament MVP, the fourth straight year the honor went to a member of a losing team. The other three were Hal Lear of Temple and two future L.A. Lakers teammates of West's—Wilt Chamberlain and Elgin Baylor. The country's top two teams at the end of the regular season, Kansas State and Kentucky, were knocked out of the NCAA tournament in the regionals—No.1 K-State by Cincinnati in the Midwest final and UK by cross-state rival Louisville in the Mideast semifinals.